These turkey stuffing recipes are very easy and simple to make. 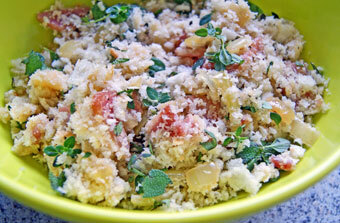 Made with breadcrumbs, our basic herb stuffing starts with bacon and fresh herbs. Use this as your base to add other ingredients, such as apple, cranberries, lemon, almonds or walnuts. You can be as creative as you wish. These stuffing recipes are not set in stone. Why not experiment and substitute ingredients to create different flavor combinations. Turkey stuffing transforms an everyday meal into something special. You can use these recipes to either stuff your turkey, or cook the stuffing separately. Begin with our basic mixed herb recipe and create your own. You can be as adventurous as you wish. Or use one of the turkey stuffing recipes below, all created from the basic herb stuffing. Melt the butter in a frying pan over a medium heat. Add the onion and bacon. Cook, stirring for 10 - 12 minutes or until the onion has softened. Transfer to a mixing bowl. Add the breadcrumbs, sage, thyme, parsley and egg. Stir well to combine. Season with salt and pepper. Melt butter in pan. Add the onion and saute for 10 - 12 minutes until the onion is soft. Transfer to a large bowl. Add the breadcrumbs, apple, prunes, thyme, sage and egg. Mix well until combined then season with salt and pepper. Melt butter and add onion, garlic and bacon. Cook until the onion is soft and transparent. 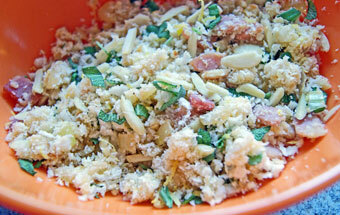 Add the onion to a large bowl, along with the breadcrumbs, almonds, tarragon, lemon zest and egg. Stir well until combined. Melt butter over medium heat. Add onion and cook until softened. Transfer to bowl. 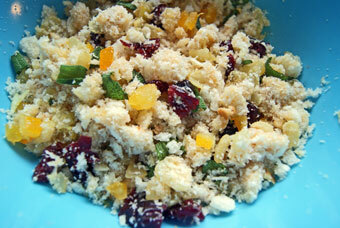 Add breadcrumbs, cranberries, pear, walnut, sage and egg. Stir until well mixed. Season as required. Stuffing can be cooked separately from your turkey. Actually this is the recommended way of cooking stuffing to avoid contamination from the turkey. Preheat oven to 350º F (180°C). Grease your pan and line with baking paper. Press the stuffing into the prepared pan and bake for 25 minutes or until golden and firm. Grease a 12 hole muffin pan. Firmly press the stuffing into the holes. Bake for 25 minutes in a moderate oven or until golden and firm. Fruit is a wonderful addition to stuffing as its sweetness helps bring out the rich flavors of the turkey. Using fresh herbs gives these turkey stuffing recipes a wonderful aroma. You can substitute the dried variety, but it won't have the same flavor. To add flavor, use day old sourdough bread. 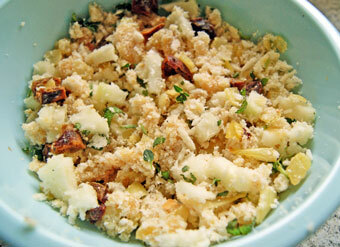 Cut off the crust and process into coarse crumbs.